“I am a survivor of the Station fire. I have worked extensively with family members and fellow survivors for the past 9 1/2 years in fundraising and offering financial and emotional support. With that being said, I truly felt as though I knew all there was to know about the fire as well as the people it affected. I have lived and breathed it since the very first night. I was wrong. I have been asked countless times to talk about that night and tell people what “really happened”. I now intend to point them toward this book. It is a comprehensive and educational account of the facts surrounding the fire and the aftermath. You could read hundreds of newspaper articles (and there are certainly hundreds) that would not give you the concise and accurate information found here. “…The best true crime book of the year is also an unlikely candidate for the best rock music book of the year. A major accomplishment on a dozen levels, and one which provides uncomfortable truths about show business, rock and roll, greed and brutal death. Killer Show is horrendous, meticulous, and as gripping a book I have read this year. …This is an indictment, and expose, a tribute…but most of all a remarkable literary (yes, literary, heavy metal fans) accomplishment of the highest order, and one which takes the traditional true crime genre to a new level of achievement. Once living and vital participants turned murder victims in a flash are located on the fortunate tape and sound recordings like ghosts who come back for justice. “…It is an anatomy of an event that should not have happened. The book explains the ignorance, arrogance, negligence, and greed that came together to create a setting that, once ignited, would kill and injure so many. “Mr. Barylick has rendered a harrowing and unflinching account of hundreds of people who, within mere seconds, were thrust into the unthinkable. “The day after the Station Fire, I remember thinking: “How could 96 people (later, 100) die in a nightclub fire in America in this day and age?” This book answers it. It answers it so clearly, and with such an emphasis on the banality of greed and laziness that set the tragedy in motion, I feel like I was naive before reading it. It leaves you feeling that it is probably going to happen again somewhere else. The description of the fire is riveting. The stories of individuals that night will leave you saddened, impressed, and infuriated. So will the stories about the actions of individuals in the days, months and years following the fire. “Today I read through Killer Show in one continuous reading session. I had always been fascinated by this case, but hadn’t thought much about it in several years. This book is written by one of the attorneys who co-led the personal injury/products liability case that achieved some measure of justice for the survivors and their families. As such he was uniquely positioned to have access to a complete set of information about the case, what happened, and the people and products which led to this tragedy. “Living in Rhode Island at the time of the Station Fire, I thought I knew what had happened that night. 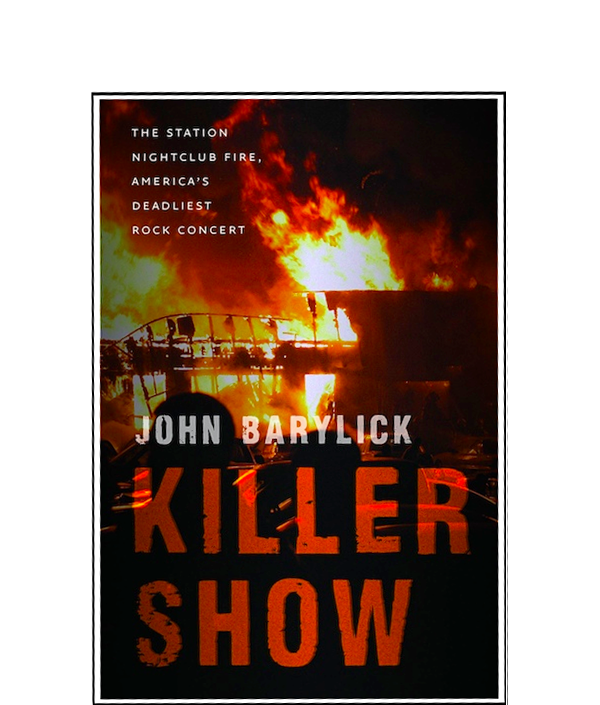 John Barylick’s book delves into all the details of this tragic event. I can only say that the victims of this fire deserve whatever memoriams and compensation possible. “This is an amazing book, and one that definitely needed to be written…. One of the most shocking things Barylick discusses is how few people were willing to take any kind of responsibility, even – perhaps especially – when their actions cost lives: the bouncers who turned people away from open exits, sending all but a few to their deaths; the journalist who kept filming, blocking an exit for crucial seconds; the club owners, who never accepted responsibility; the leader of the band; city officials who failed their jobs at the most basic level. Only one man ever accepted responsibility for what happened, and he was all but the last link in the chain. “…Barylick structures the story with care and his writing is strong. The result is a gripping account that will hold you to the last word. “If you are a shoddy landlord or an ageing heavy metal rocker who uses pyrotechnics to cover up your complete lack of talent, you do not want John Barylick to write a book about you. Even your own mother will end up wanting to nail your head to the floor. This author commands the weapons of the English language, and he knows all of the facts behind your pathetic penny-pinching motives for dodging the building codes, or setting off fireworks in an enclosed space that also contained 462 human souls. “…The incredible amount of research required to compile this account is evident in the level of details (not to mention the nearly 40 pages of notes), but this isn’t a dry technical report. Instead, the author has done an incredible job of bringing the story to life, evoking a wide range of emotions, from outrage at the gross disregard for safety that resulted from greed, to admiration for the strength and courage of any number of survivors. “In his thoughtfully written and well researched book Mr. Barylick sets himself apart from many of his colleagues in his chosen profession as a man of integrity, empathy and ethics. I say this as a life long resident of the state of RI having followed Mr. Barylick in the news as he led the Plaintiff Steering Committee in hopes of salvaging some justice for the victims of this entirely preventable tragedy. Excellent book !! Very thoroughly investigated and well written. As a former firefighter for 17 years, I highly recommend this book. The author researched this incident giving personal accounts, legalities, fire science, and accounts of some of the people that were involved in tis tragedy. This is an outstanding book. There were times I was so angry I wanted to scream. The author should be commended for the excellent research he did to tell this horrific story. It’s a must read for anyone who has ever been to a rock concert.